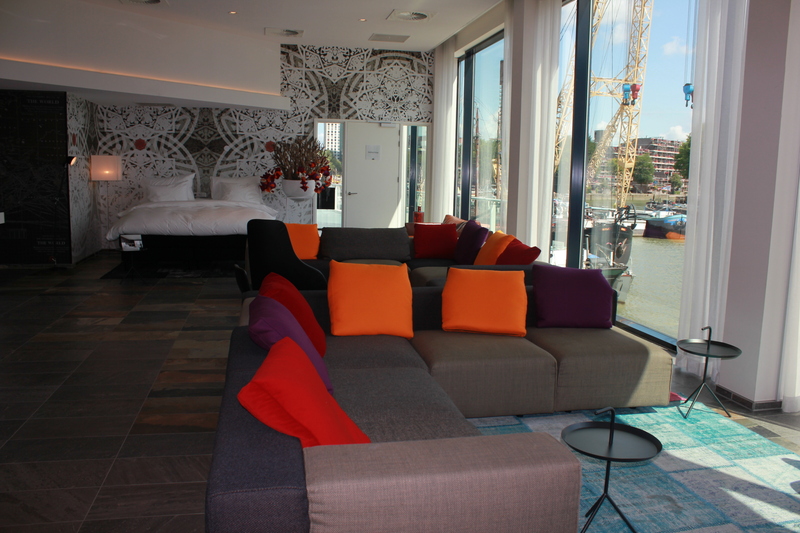 As promised today I will post my review about my stay at the Mainport Design Hotel in Rotterdam. I loved this hotel so much that I have decided to post several posts about this beautiful venue. This one will be based on my own experiences, my stay and the over all experience. I will also write an article about some special elements of this gorg venue because I was honestly stunned with all the little details in this hotel. 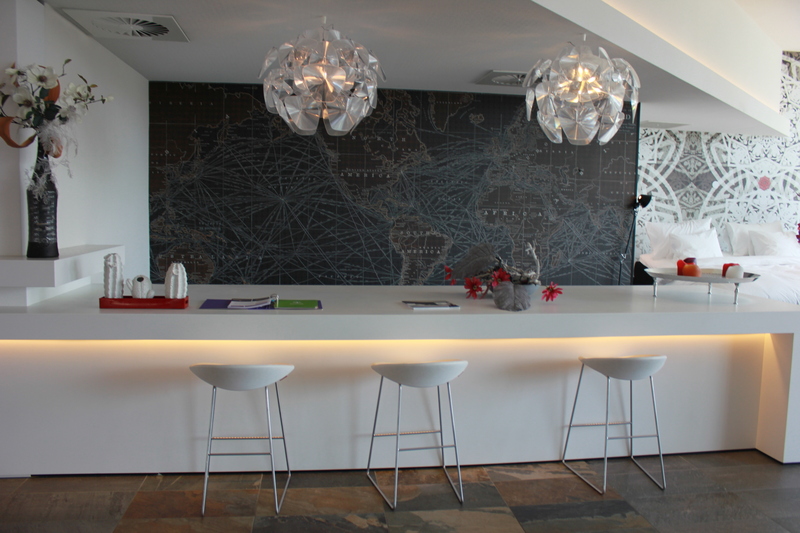 The Mainport Design Hotel is located in the city center of Rotterdam. It is very conveniently to reach by car or public transportation. 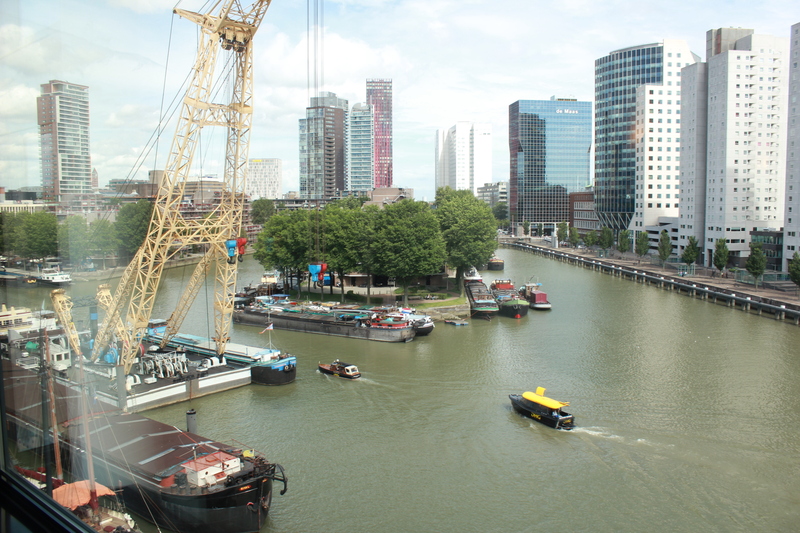 The hotel has a garage where you can park your vehicle and public transportation wise, the metro that you can take from the central station of Rotterdam stops exactly in front of the Mainport Design Hotel. This ride only take about 5 minutes and the stop at the hotel is called ‘Leuvehaven’. I checked in, received all my information and was guided by the doorman to my room. I stayed at room 664 in a Waterfront Spa room on the 6th floor. 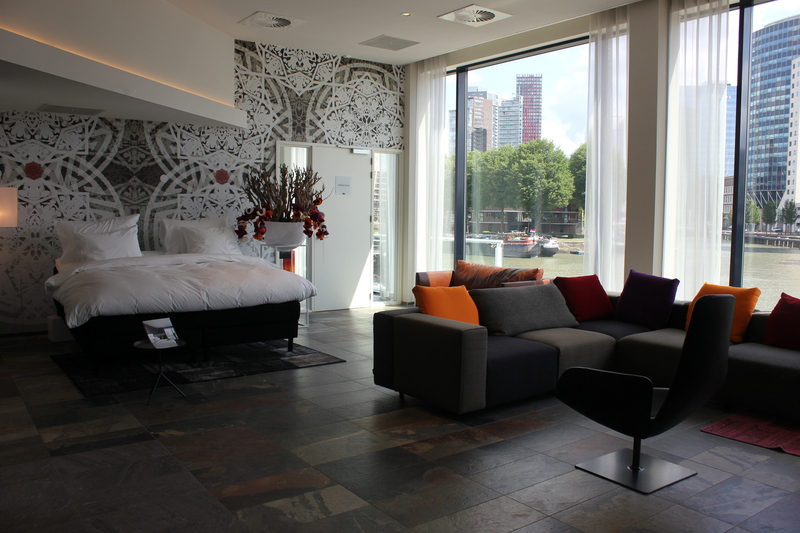 The big eye-catcher of this room is the big jaccuzi near the window where you can take a bath while you are enjoying the gorgeous view of the city of Rotterdam. And the jacuzzi is not the only reason why this is called a ‘Spa’ room. You also have your own private sauna in your bathroom that fits up to 2 people. I have sat in the sauna for quite some time in the middle of the night when I was done working on my article. And I must tell you, having the luxury of having a relax-sesh in the middle of the night in your private sauna is priceless! I love every one of the small details in this room and even in the sauna. The set up of this bucket and delicious smelling oil is just perfect. I love how they even thought of putting a nice scented oil in the sauna. 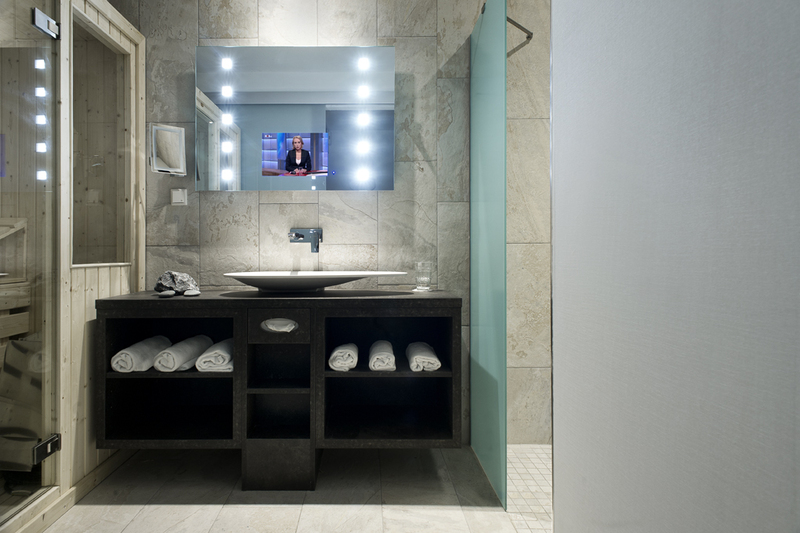 Also a luxury detail in the beautiful bathroom, there is a T.V ‘inside’ the mirror as you can see in the picture below. So while you are brushing your teeth, putting on your make up, shaving your beard or what ever you decide to do in front of the mirror : ) you can watch the telly. You never have to miss the news or your fave show now. Isn’t that just very considerate of the Mainport hotel? Yes, like I mentioned before and will probably mention a few times more, it is all in the details. Malin+Goetz. I tried all the products that they offered and especially liked the Malin+Goetz peppermint shampoo! So Back to the jacuzzi, I showed some pictures of this wonderful jacuzzi in a previous post but I have to share some pictures again because it is just A-MA-ZING ! As you can see on the top right side of the picture below, you have a huge LCD Flatscreen TV so if you get bored with the view from the window, which I highly doubt, you can always turn on the telly and watch your fave show! Behind the jacuzzi is the kingsize bed. This bed is specially designed for the Mainport hotel and it is huge! (2m-2.10m) The bed is perfectly located in the room because when you wake up you have a perfect view since the bed is in the opposite of the huge windows. 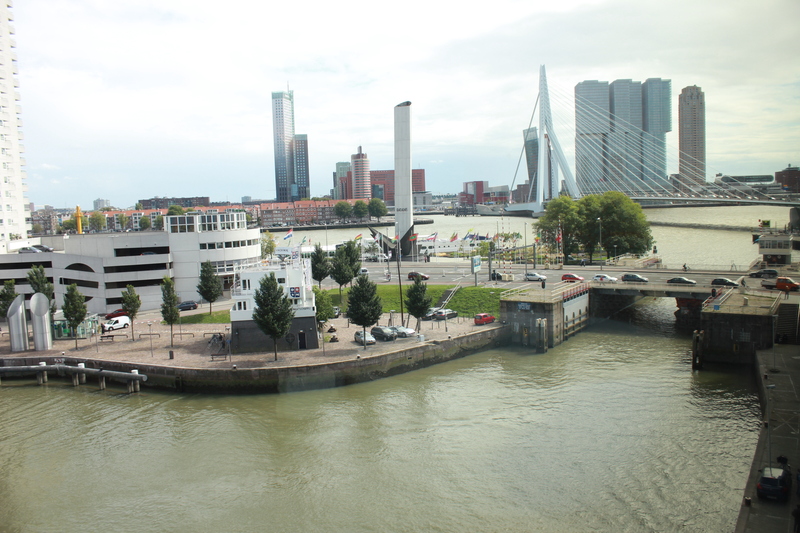 Wake up and enjoy the Rotterdam Skyline. When talking about this room the term ‘A room with a view’ is often mentioned and I can understand why. Just take a look at the gorgeous pictures below! 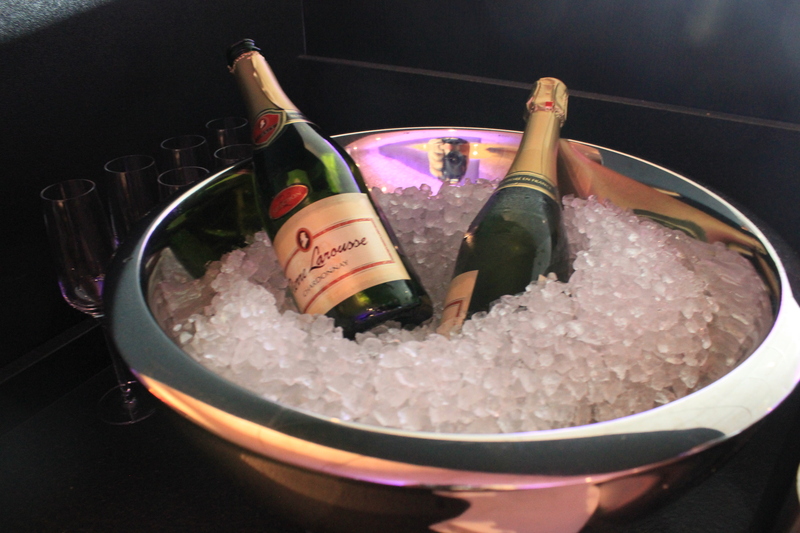 And yes they have some very special items in their minibar. Other than the very luxurious IIly espresso machine they also have special item from the 50 Shades of Grey merchandise. I have stayed in a lot of hotels and villa’s worldwide but this was a first for me. 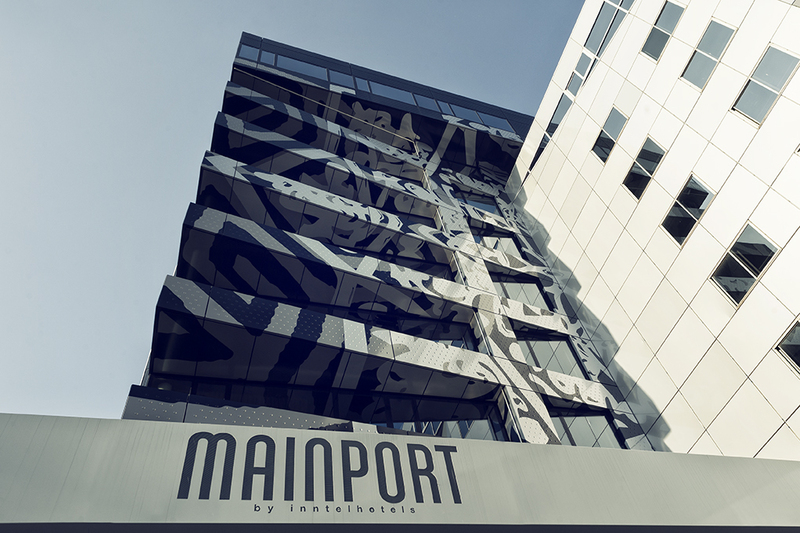 I love how creative, inventive and daring the Mainport hotel is. This is such a cool item to have in your mini bar! Next to the FSOG box you can see condom, and no, not just any condom. This is a designerscondom. Seriously, I would even buy it for the packaging only. I have never seen a condompackage that looked so expensive and luxurious. There are those details again, I tell ya. I love it. The hotel also has a shared pool with club H2O from the Intell Hotel which you can enter directly from the 8th floor where also the Spa Heaven is located. As you can see at the picture on the left side they have beautiful and luxurious lounge chairs as well with a perfect view again of the city of Rotterdam. 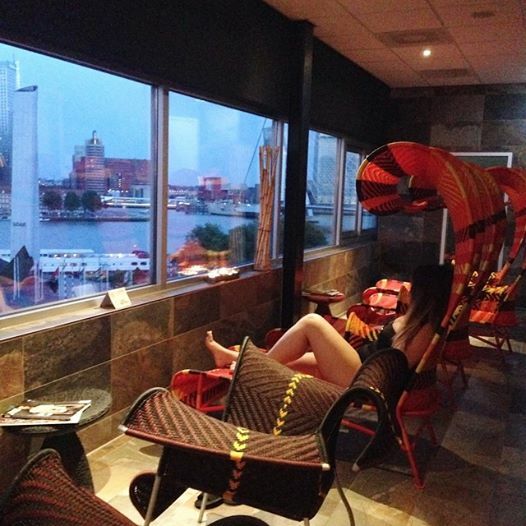 So after your 15 minutes in the heat of the sauna you can take a rest, read some magazines that are provided, enjoy the view and enter the Turkish Steam room. The treatment rooms are located behind these chairs. 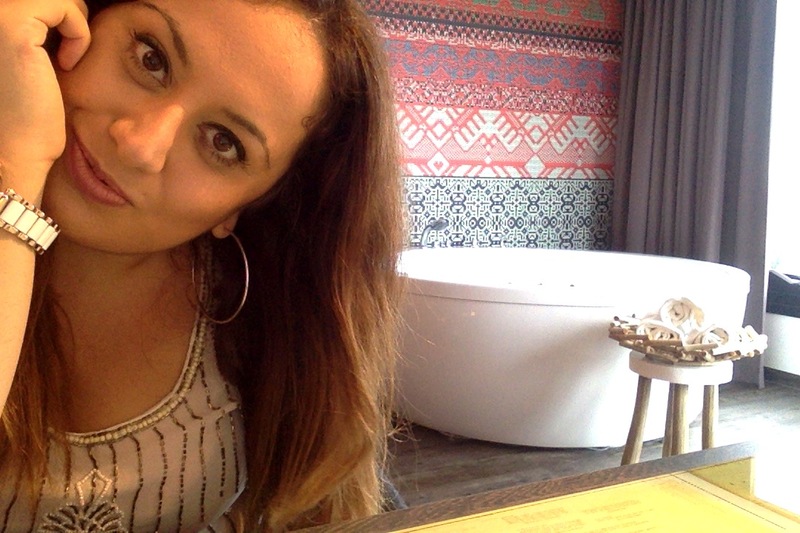 The Hamman room is gorge and I will definitely go back for a Hammam treatment any day soon! This spa is different than other spa’s I have visited because non of the spa’s I have ever been at have these big windows. The floor to ceiling window concept is everywhere in the hotel and I am so happy that they also have these windows in Spa Heaven. Cool thing about the name ‘Down Under’. Since the restaurant is literally located ‘Down Under’ the name is very well chosen. I love how they decorated the space ‘Down Under’. 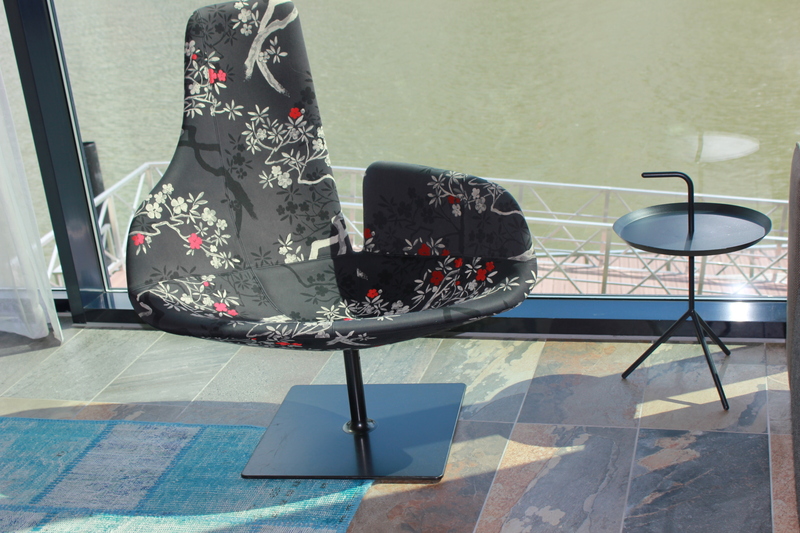 The beautiful black combined with red and purple has that luxury feel to it. And the colored wall paper just is the perfect finishing touch! 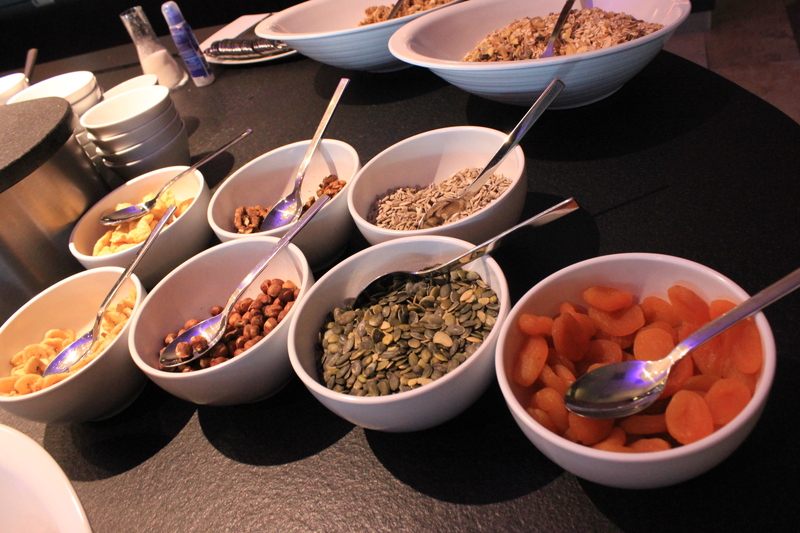 Yes, they offer champagne during your breakfast, I mean, who could resist this? 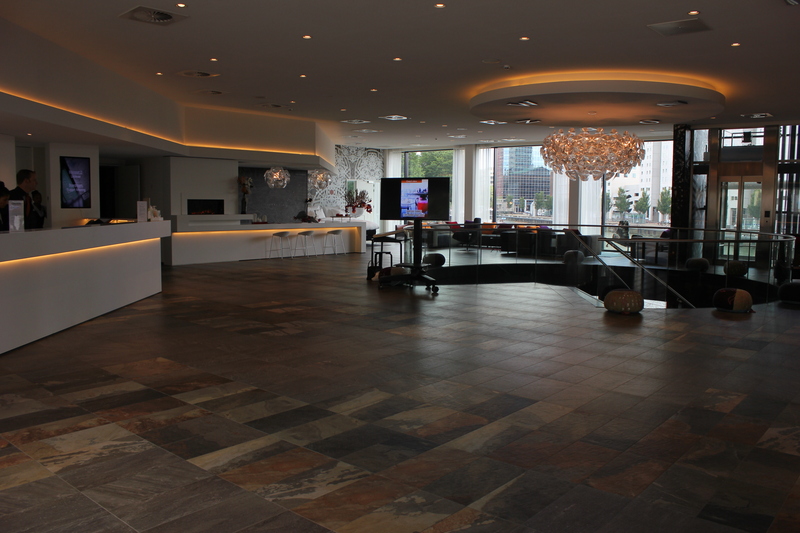 And I also wanted to share some pictures with the beautiful entrance hall/lobby. It is very big and spacious and the minute you walk in it feels like you are in a 5 star hotel in NYC. I honestly don’t know hotels like these in the Netherlands. 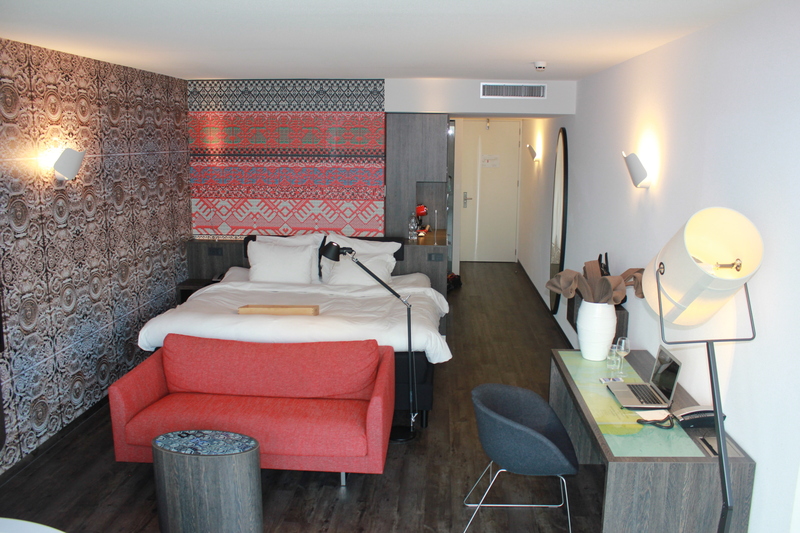 I am so pleased that the Netherlands has such a beautiful design 5 star hotel now ! Yes another world map in the lobby. I adore there theme. 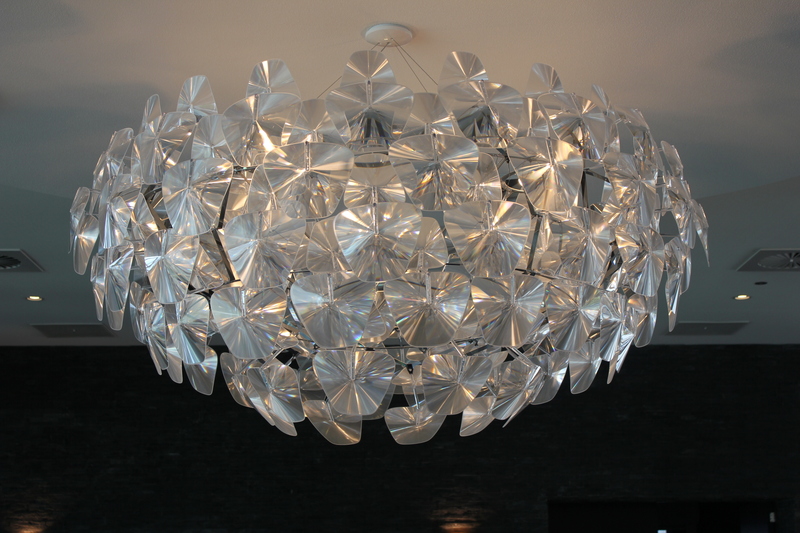 And have you seen those lamps, one word: AMAZING! 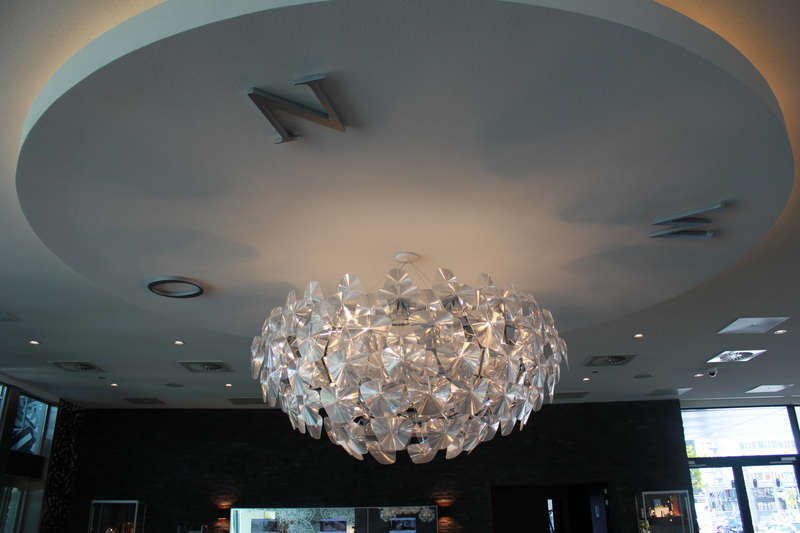 Love this chandelier-lamp deco, and have you seen the compass around it. 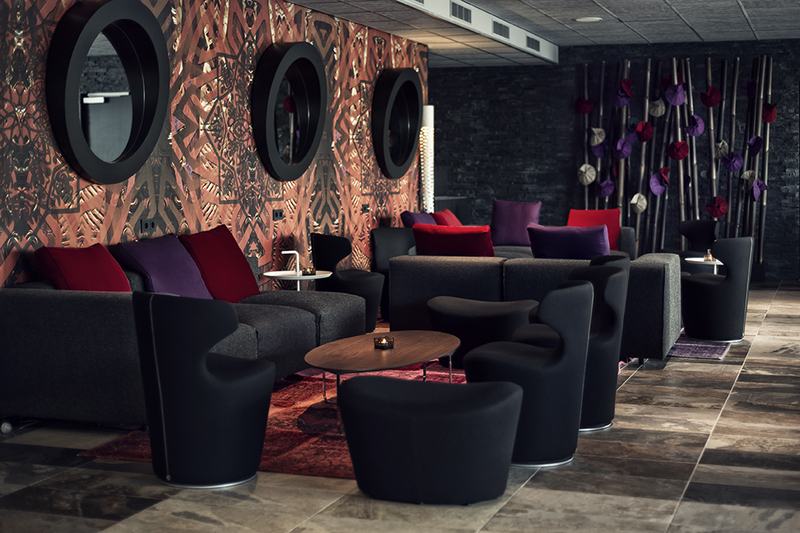 I will write another article about the designer and architect of this hotel because it really deserves a separate post! A bed in the lobby? Sure, why not ! And last but not least, I saw this chair in the lobby and I completely fell in love. Would totally want this chair in my own apartment. The pattern reminds me of my time in Tokyo and I absolutely love it. 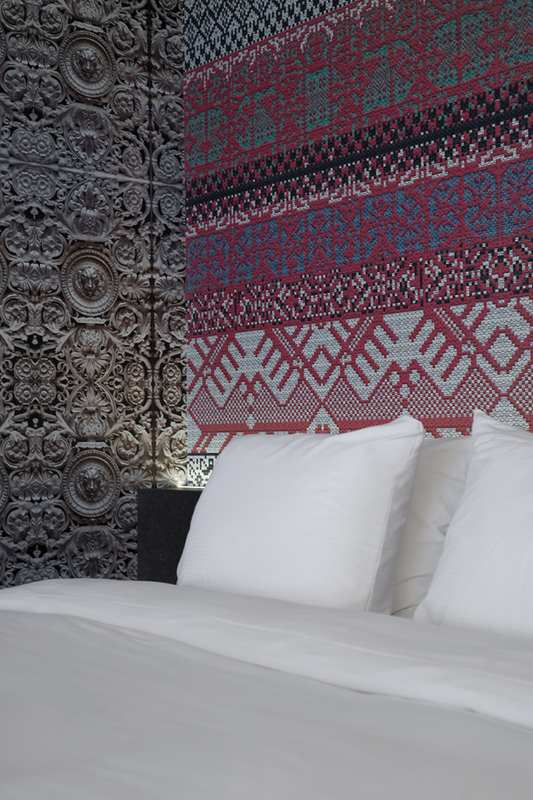 This hotel is a must visit for all the design and luxury lovers, honeymooners, citytrippers and just everyone who appreciates the finer things in life. I absolutely loved this venue and will go back for sure. Ik heb je genomineerd voor The Liebster Blogawards. Kijk voor meer info in het artikel op m’n blog! Ik weet nog niet wat het inhoud maar het klinkt superlief! Ik ga het als ik thuis ben direct even checken.